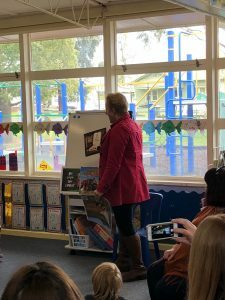 To celebrate Book Week this year, we invited local Penshurst farmer, author and photographer Tracey Kruger to visit our school to share her new books We Love the Farm Machines and We Love the Farm Animals. Lismore students were joined by students from Derrinallum College and children from Western Plains Kindergarten encouraging and promoting positive connections within our local community. Thanks Tracey for sharing your knowledge and presenting your books with such enthusiasm. Lismore Primary School strongly values the input of parents and the wider community. We understand that in order to provide the best possible outcomes for students, a positive home/school relationship is essential. Lismore Primary School is committed to developing strong links with the wider community. Our students are encouraged to be involved in community projects and annual events including the Lismore Photography Show and Lismore Art Show. Our 3-6 students visit the Lismore Health Centre at various times throughout the year to engage in activities with the elderly. Lismore Primary School works in collaboration with the local Lismore/Derrinallum Pre-School to ensure a smooth transition from kindergarten to primary school. Likewise, we are committed to working with local secondary schools to develop a partnership that supports the successful transition from year 6 to secondary school. Please click on the link below for a copy of our 2018 Parent Handbook.